The last Will and Testament of Mr. Stephen Hopkins exhibited upon the Oathes of mr Willm Bradford and Captaine Miles Standish at the generall Court holden at Plymouth the xxth of August Anno dm 1644 as it followeth in these wordes vizt. The True Origin of Stephen Hopkins of the Mayflower, by Caleb Johnson, The American Genealogist, Vol. 72, No. 3, July 1998. 1. STEPHEN HOPKINS b. prob Hampshire, England, ca 1582, poss son of John Hopkins of Winchester; Stephen d. Plymouth bet 6 June and 17 July 1644. He m.(1) MARY ----, who was bur. Hursley, Hampshire, 9 May 1613. He m.(2) St. Mary Mallon, Whitechapel, London, England, 19 Feb. 1617/18 ELIZABETH FISHER, who d. Plymouth bef 6 June 1644. Stephen Hopkins was from Hampshire, England. He married his first wife, Mary, and in the parish of Hursley, Hampshire; he and wife Mary had their children Elizabeth, Constance, and Giles all baptized there. It has long been claimed that the Hopkins family was from Wortley, Gloucester, but this was disproven in 1998. For more information on the true English origins of Stephen Hopkins, see the "Published Research" section at the bottom of this page. Stephen Hopkins went with the ship Sea Venture on a voyage to Jamestown, Virginia in 1609 as a minister's clerk, but the ship wrecked in the "Isle of Devils" in the Bermudas. Stranded on an island for ten months, the passengers and crew survived on turtles, birds, and wild pigs. Six months into the castaway, Stephen Hopkins and several others organized a mutiny against the current governor. The mutiny was discovered and Stephen was sentenced to death. However, he pleaded with sorrow and tears. "So penitent he was, and made so much moan, alleging the ruin of his wife and children in this his trespass, as it wrought in the hearts of all the better sorts of the company". He managed to get his sentence commuted. Eventually the castaways built a small ship and sailed themselves to Jamestown. How long Stephen remained in Jamestown is not known. However, while he was gone, his wife Mary died. She was buried in Hursley on 9 May 1613, and left behind a probate estate which mentions her children Elizabeth, Constance and Giles. Stephen was back in England by 1617, when he married Elizabeth Fisher, but apparently had every intention of bringing his family back to Virginia. Their first child, Damaris, was born about 1618. 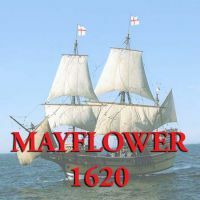 In 1620, Stephen Hopkins brought his wife, and children Constance, Giles, and Damaris on the Mayflower (child Elizabeth apparently had died). Stephen was a fairly active member of the Pilgrims shortly after arrival, perhaps a result of his being one of the few individuals who had been to Virginia previously. He was a part of all the early exploring missions, and was used almost as an "expert" on Native Americans for the first few contacts. While out exploring, Stephen recognized and identified an Indian deer trap. And when Samoset walked into Plymouth and welcomed the English, he was housed in Stephen Hopkins' house for the night. Stephen was also sent on several of the ambassadorial missions to meet with the various Indian groups in the region. Stephen was an assistant to the governor through 1636, and volunteered for the Pequot War of 1637 but was never called to serve. By the late 1630s, however, Stephen began to occasionally run afoul of the Plymouth authorities, as he apparently opened up a shop and served alcohol. In 1636 he got into a fight with John Tisdale and seriously wounded him. In 1637, he was fined for allowing drinking and shuffleboard playing on Sunday. Early the next year he was fined for allowing people to drink excessively in his house: guest William Reynolds was fined, but the others were acquitted. In 1638 he was twice fined for selling beer at twice the actual value, and in 1639 he was fined for selling a looking glass for twice what it would cost if bought in the Bay Colony. Also in 1638, Stephen Hopkins' maidservant got pregnant from Arthur Peach, who was subsequently executed for murdering an Indian. The Plymouth Court ruled he was financially responsible for her and her child for the next two years (the amount remaining on her term of service). Stephen, in contempt of court, threw Dorothy out of his household and refused to provide for her, so the court committed him to custody. John Holmes stepped in and purchased Dorothy's remaining two years of service from him: agreeing to support her and child. Stephen died in 1644, and made out a will, asking to be buried near his wife, and naming his surviving children. [S00087] Hopkins, Stephen: The Probable Parentage of Stephen Hopkins of the Mayflower, Caleb Johnson, (Name: The American Genealogist, Vol. 79. No. 4; Location: PO Box 398, Demorest, GA 30535-0398; Date: 1998;). [S00119] Great Migration Begins: Immigrants to New England 1630-1633, Vol I-III, The, Anderson, Robert Charles, (New England Historical and Genealogical Society, 1996-2011), Hopkins, Stephen. [S00091] Hopkins, Stephen, Mayflower Families Through Five Generations, John G. Austin, (The Mayflower Society of Massachusetts; Location: New York State Library; Date: 2001), Page 5, Family 1, Stephen Hopkins. [S00087] Hopkins, Stephen: The Probable Parentage of Stephen Hopkins of the Mayflower, Caleb Johnson, (Name: The American Genealogist, Vol. 79. No. 4; Location: PO Box 398, Demorest, GA 30535-0398; Date: 1998;), PDF Version of the Article.